Welcome to the JAH Movies page. The film DUNE (not the book) which is supposedly science-fiction, and visually is portrayed as such in the film, is, in reality, a TRUE story that is unfolding now and it is about GIBRALTAR - Gebal Tariq - The Rock of "The Night-Visitant" (in Arabic). . . If you were the extra-terrestrial Ruler and 'King of the Universe'; Who had sent information CRITICAL to the survival of human+Beings, over thousands of Earth years, in exact and minute detail, and the relatively primitive inhabitants of Planet Earth had turned parts of it into nonsensical, ritualistic religious "rites and ceremonies" so that no-one read and studied the actual information with an open-mind and without applying incorrect preconsceived ideas to it anymore; how would you reach those people who deserved to SURVIVE? George Lucas quite naturally believes that he wrote "Starwars", when, in reality, he was told telepathically what to write, by the very "Force" to which the films refer, as a very important step in the preparation of mankind for the long-awaited TRUTH, about the real reasons for human life on Earth ("what on earth am I doing here? "), the meaning of life and its purpose. What does JEDI mean? Could YOU complete "The Training"? Where, on THIS planet, is ENDOR? It IS on planet Earth. The following is a collection of readings taken from The Book of Daily Instruction known as YODA - Jedi Master*, which consists of the Divinely Inspired Daily Messages and Teaching from Our Lord, in "God Calling" and "God at Eventide", about how to use The Force of Divine Power, that were written down by 'Two Listeners', who opted to remain anonymous. Your Daily Jesus disciple Teacher. UFOs: "The Way home or face The Fire" & "The King of kings' Bible". Biogenesis. Scully: "Mulder, it's me. I found a key, THE KEY … to every question that has ever been asked. It's a puzzle but the pieces are there for us to put together, and I know that they can save YOU (reading this) if you can just hold on." 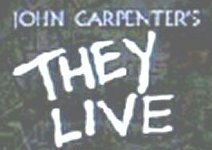 The film "They Live", by John Carpenter (1988), demonstrates both the fight on Earth, between the servants of God and the servants of Satan and his mammon-materialism, who are finally discovered, revealed and defeated, and also that things on this planet are seldom as they seem to be, due to Satan’s lies that he has used to deceive the whole world and give people truth-blindness. The DVDs contain edited footage, the explanation of the movie, JAH's web-site and his radio broadcasts.